Alexander Salak Joins Mink on PlanetUSA All-Star Team · Let's Go Amerks! I dislike posting press releases instead of writing my own content, but sometimes it’s the easiest thing when I only have a few minutes. 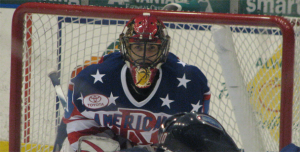 (Rochester, NY)… Rochester Americans goalie Alexander Salak has been named to the PlanetUSA team for the 2010 Time Warner Cable AHL All-Star Classic, which will be held January 18th-19th at the Cumberland County Civic Center in Portland, Maine. He joins teammate Graham Mink as a member of the PlanetUSA squad. Mink was named the all-star team’s captain earlier this month. 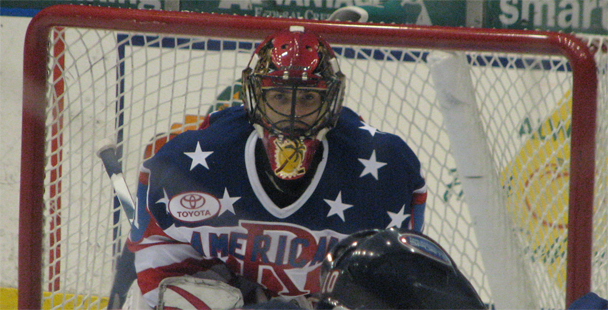 Salak boasts a 16-4-0 record with 583 saves in 22 games with the Amerks. The rookie also carries a 2.33 goals-against average and .927 save percentage. Despite missing the last three games, he is still tied for second in the league in wins and is tied for seventh in save percentage. The 22 year old has played in 67 minutes in two games with the Florida Panthers this season. The native of Strakonice, Czech Republic, signed an entry-level contract with Florida on May 29, 2009. Rochester kicks off its week on the road against the Hamilton Bulldogs tonight at Copps Coliseum. The 7:30 p.m. contest will be carried live on SportsRadio 1280 WHTK and FM 107.3, Rochester’s Sports Talk. The 2010 Time Warner Cable AHL All-Star Classic will feature the 2010 AHL All-Star Skills Competition on Monday, January 18th (8:00 p.m. ET) and the 2010 AHL All-Star Game on Tuesday, January 19th (6:00 p.m. ET), and will be televised live nationally in the United States and Canada. To purchase tickets call (207) 775-3458, visit the Cumberland County Civic Center Box Office or go on-line at portlandpirates.com.